There is so much to do that we hardly know where to begin. Depending on the time of the year you can enjoy the great outdoors, now called eco-tourism, or explore history unlike any elsewhere. I’m too busy to think about what there is to do. ~ Frank M.
At any time of the year a great place to begin is at the Penelope Barker House Welcome Center (on Broad Street at the waterfront), which is open seven days a week from 10 am to 5 pm and folks there are always willing to let you know about activities going on around town. You may be here at exactly the right moment to enjoy the annual Christmas Tour. Or at anytime, take a Trolley ride tour of Edenton from the Welcome Center. During the summer, take in a Steamer’s game and if you are very lucky, be here for the best little town’s 4th of July fireworks show. Of course, the Museum Trail (a walking tour of historic sites) and the shops and restaurants along Broad Street are always here. One of Edenton’s great assets is the fact it is a great walkable town. There are thousands of photographic subjects in Edenton and Chowan County, ranging from unbelievable sunsets, to historic structures, swamp trails or living nature. “November 14 – 27, 2002: Goodview, Minnesota. She traveled 170 miles southeast out of the Prairie Pothole Region and has stopping along the Mississippi River near the southeast Minnesota-Wisconsin border. December 1, 2002: Lake Mattamuskeet, North Carolina. She made a big jump, approximately 950 miles southeast, from the Mississippi River to Lake Mattamuskeet in Eastern North Carolina. (ed. 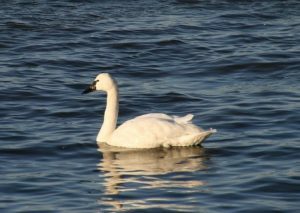 note: About an hour from Edenton) Lake Mattamuskeet is a well-know wintering area for tundra swans with some of the largest concentrations of birds along the east coast. December 2, 2002 – March 1, 2003: Phelps Lake, North Carolina. The swan spent most of the winter in North Carolina near Lake Phelps (ed. note: about 30 minutes from Edenton) , which is located between Albemarle and Pamilco Sounds. This low-lying area near the coast has a good mix of crop fields and open water areas for feeding and roosting. The area winters large numbers of waterfowl including a large portion of the Atlantic Flyway tundra swan population. 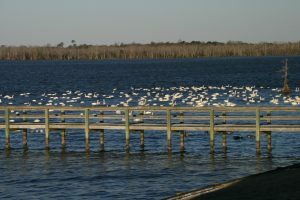 There are several National Wildlife Refuges in this portion of North Carolina including Lake Mattamuskeet and Pungo refuges. Begin your exploration in Edenton. One of the best overviews is found by walking the Museum Trail. Doing so will have you begin at the Penelope Barker Welcome Center, dedicated to the memory of her leadership in organizing the first political demonstration by women in the new world. You do not jave to start the trail there, but it is a good place to get your bearing. But, what is a museum trail? The breadth of Edenton’s story simply is too big to fit inside a single structure unless you want to forget about the original and still standing historic buildings that are part of this little town’s amazing contribution to the creation of the United States and to North Carolina. Their contents go beyond buildings to include stories about amazing people who served as the first colonial Governor (Charles Eden) of North Carolina; told a King “NO” (Penelope Barker); signed the Declaration of Independence and the Constitution (Hugh Williamson) and helped write both; created our first navy (Joseph Hewes); served as George Washington’s appointee to the very first U. S. Supreme Court (James Iredell); and many U. S. Senators, Representatives and Governors of North Carolina and slaves who became highly respected, freed, real estate owners, carpenters and builders of churches and homes around Edenton. To see the list of Museum Trail sites and view the walkable map, check out this Penelope Barker Welcome Center site. Walking from there you’ll see the 1767 Historic Courthouse (oldest in-use courthouse in the country), the home of James Iredell, one of George Washington’s appointees to the first US Supreme Court (by the way, he was appointed one day and confirmed by the US Senate the next) and many more sites. Edenton is a great base camp for those wishing to explore the western end of the Albemarle Sound. Site X on Salmon Creek, Somerset Place, Cashie River Center, the Ironclad CSS Albemarle Museum at Plymouth, or the state’s oldest brick home at Hertford. Day 1: Start your exploration of Nicholas Sparks country on North Carolina’s coast in the pretty river town of Edenton, where Sparks set The Rescue. Day 2: Take U.S. 17 through the small towns of Williamston and Washington before settling into New Bern, where Sparks lives, works and has set several of his novels. Day 3: Head down the coast through Swansboro and on to “Hollywood East” in Wilmington before ending your exploration of Nicholas Sparks country in Southport, the setting for the recent Sparks hit novel and film, Safe Haven. Check out their more fully detailed suggested Spark’s route. Somerset Place Historic Site is just a 30-minutes away. The Plantation was developed by Edentonians Nathaniel Allen, Samuel Dickinson, Josiah Collins and other investors. Samuel Dickinson lived in the Cupola House and Josiah Collins’ descendants still live in the Homestead. The Plantation eventually consisted of over 100,000 acres adjacent to Lake Phelps. Check their site for hours and events. Roanoke Cashie River Center (pronounced ca shy) offers a great opportunity to learn more about the rivers and streams feeding the Albemarle Sound. The Center’s Facebook page has current information about hours and events. Been To An Estuarium Recently? How often have you visited an Estuarium? Few exist and the one at Washington, NC is handy and informative. 223 East Water Street, Washington. What exactly is an estuarium? Odds are that you do not live near an estuarium, which is defined as the wide part of a river where it nears the sea, fresh and salt water mix. You can reach the folks in Washington via email at: estuarium@embarqmail.com , by telephone at 252.948.0000 or check out the the scheduled activities on their web site, for details. The Chowan arts Council is near the waterfront on South Broad and offers art for sale, special showings and many exciting engagements with regional artists. Check out their latest. Retirees with an artistic interest and other artists are learning about plans to create an Artist Retreat in Edenton. The developers plan to offer work space to visiting artists and create studio space for all types of art endeavors: painting, sculpture, glass, ceramics, etc. Have a neat idea for your retirement? Contact them and see what you can create. 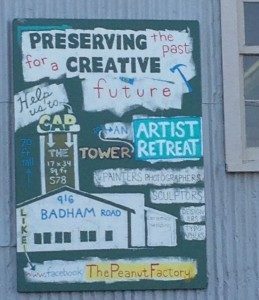 The Artist’s Retreat is located in an old peanut warehouse, thus the name “Peanut Factory,” which stood vacant and ignored for decades. It is being converted into a artist’s work space at 916 Badham Road, Edenton. For more information, contact Julia Townsend at 252 632-0346 or via email juliatownsend@yahoo.com or see their Facebook page.